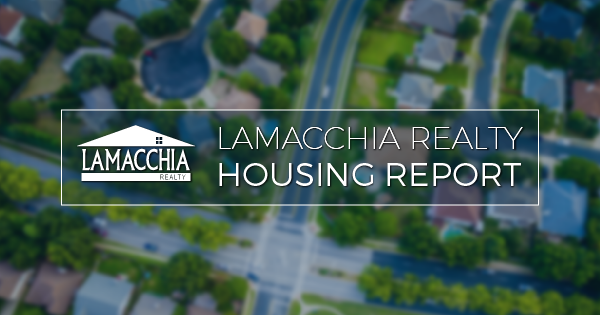 The Lamacchia Housing Report presents overall home sale statistics and highlights the average sale prices for single families, condominiums, and multi-family homes in Massachusetts and Southern New Hampshire for January 2019 compared to January 2018. It also looks at other metrics in Massachusetts like Homes Listed for Sale, Homes Pending, and Price Adjustments made to active listings, as they are often the best indicators for predicting future trends in the market. There were about 620 fewer homes sold this year compared to last year at this time, down almost 11%. Sales were down in all three categories; condos are down 13.43%, from 1,444 to 1,250, single families are down 10.3% now at 3,230 from 3,601, and multi-families are down 8.85% with 546 sales compared to 599 in January 2018. Prices are up 3.64% year over year, with increases in all three categories. Condos and Multi-families are up by 8.47% and 8.91% respectively and single families are up by .01%- $63 to be exact. The new year brought us the first January in six years that inventory was higher than the year before. Every year since 2012 we have been saying January is the lowest inventory we’ve seen and finally, as Anthony predicted last fall, the story has changed. Case and point, the number of homes listed for sale in January was up almost 24% since last year, now at 6,760 from 5,457. Pending home sales are up 9.82% this year over last, meaning we are likely to see a rise in home sales for February. This goes to show buyers are out there taking advantage of the choices they now have as there were 6,081 homes that went pending compared to 5,537 last year. Sellers should list soon and get their homes under agreement before inventory continues to increase! 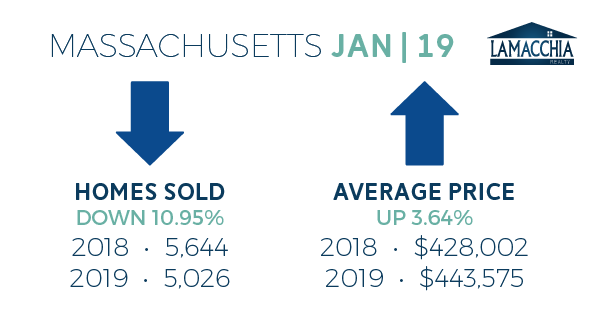 There was a 68.56% increase in price adjustments in Massachusetts year over year, with 538 in 2019 compared to 319 last year. With such a jump in inventory, sellers have to be careful with their list prices. Looking at last year’s comparable sales won’t necessarily tell the whole story. More homes on the market give buyers have more options, so sellers need to be aggressive with their pricing to build seller interest. 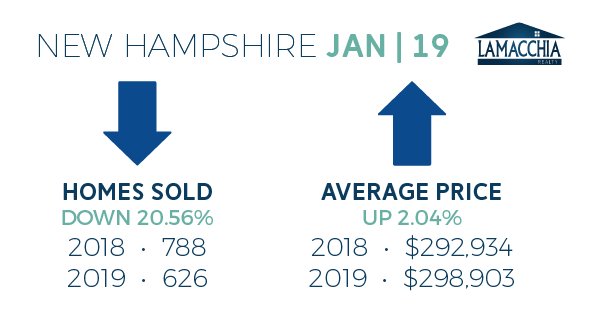 New Hampshire experienced a decrease in sales and an increase in prices in January of 2019 compared to January 2018. There were 788 sales last year compared to 626 this year, down in all three categories. Prices are up slightly, by just over 2%, now at $298,903 from $292,934. They would have been up by more, but multi-family prices decreased by almost 32% and that brought the average down. Prices were up by about 8% in singles and condos. 2019 is off to new beginnings with inventory levels higher than we’ve seen in January in six years. Sellers take heed, listing before March will yield higher sale prices. If you’re thinking of selling early this year, prepare your home for a winter sale and do it as soon as possible! Buyers, get excited that the ball is finally going to be back in your court earlier this year. Often buyers have had to wait until mid-summer through fall for a decent amount of homes to choose from, and that will still be the case, but it will start sooner and inventory levels will likely be higher all year than they were last year.